Promotional Wenger bags are the ideal fit for our modern and multi-purpose lifestyle. Stylish and functional all at once. Branded Wenger Travel Luggage is designed in Switzerland by this famous brand to exacting standards of quality. 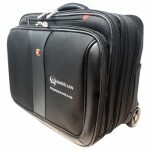 Promotional Wenger Travel luggage can be branded with your logo and message to create a unique product. Branded Wenger Travel bags are an established success with Business travelers across the globe. Wenger are so proud of their products that every item has a life long replacement warranty. Promotional Wenger Luggage is perfect for your next Business trip or overseas conference and will promote your corporate message at the same time. They also make the ideal reward or gift for esteemed colleagues and clients alike. Contact our UK Sales Team now on 01276 450220 now for more details now! 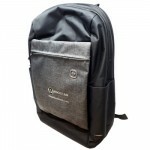 Branded Magellan Wenger Backpack can be embroidered with your logo on the front. .. 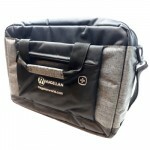 Promotional Laptop Bag for 16" devices. High quality item to protect your valuable laptop from damag.. 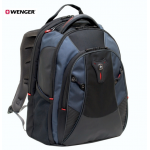 Promotional Wenger Cobalt Laptop Backpack is a super comfortable and secure way to carry Laptops up .. 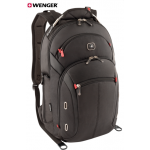 Promotional Wenger Legacy Laptop Case offers supreme protection for Laptops up to 17" with its uniqu.. 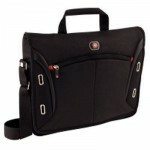 Promotional Wenger Sensor Macbook Pro Briefcase is designed to fit the 15" Macbook Pro and comes wit.. Triple padded compartment protects up to a 17" laptop. CaseBase Stabilizing platform allows it to st..
Padded compartments with anti-stratch lining for a 15"" MacBook Pro and iPad. Case Base platform kee..
Padded laptop compartment and tablet / eReader pocket with Anti-scratch liningMultipurpose zippered ..
16"" / 41 cm Laptop Briefcase with Tablet / eReader PocketPadded laptop compartment and tablet / eRe.. Fits most 15" notebooksProtective notebook compartmentTablet pocketQuik pocketBusiness organiserShoc.. Fits most 16“ notebooksTriple Layer Protection notebook compartmentQuik PocketBusiness organiserAir-.. Box quantity: 2*Sub-category: Roller CasesManufacturer: WengerWeight (Kg): 4.86W..
Padded 16" Laptop Compartment and 10" tablet pocket with anti-stratch lining.Soft padding in all ele..
Padded Triple Protect 16" Laptop Compartment. Freely standing bag due to CaseBase stabilizing Platfo.. Promotional Wenger Resolution 10 iPad Sleeve is designed to fit the 10" profile of the Apple iPad an.. Promotional Wenger Resolution 13 iPad Sleeve is designed to fit the MacBook and MacBook Pro.Wenger l..